On Saturday, June 16, enjoy a country drive to the beautiful Santa Clara River Valley! Our June event take us along scenic roads through canyons and farmlands to Santa Paula, the “Citrus Capitol of the World”. 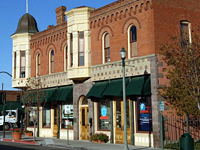 Our destination is the California Oil Museum, housed in a restored 1800’s Victorian-era building which was the headquarters offices of the Union Oil Company. Lunch will follow at a nearby restaurant in historic downtown Santa Paula. Suggested donation is $4 per person for the tour. A private guided tour of the original Union Oil Company headquarters, preserved as it was in the 1890’s, plus a re-created 1930’s apartment. One of the largest vintage gas pump displays in California. Exhibits detailing the history of the oil industry in our state. A working turn-of-the-century cable tool rig. Special exhibit: “When Dams Fail: Lessons Learned from St. Francis and Other Notable Incidents”. This exhibit tells the 90-year-old story of one of the worst engineering disasters in American history, and second worst loss of life in California’s history. Special exhibit: A gallery showcasing the 16 victims of the tragedy from Santa Paula. Watch for a flyer in the mail for more information. May Recap: 18 members and guests and four TCs took part in our Julian Double Day. TCs were driven by Loe, Simmons, Edgar and Thelander, with a fifth guest TC making an appearance. See the upcoming newsletter for more details. The June Midget Chassis is online and ready for viewing!